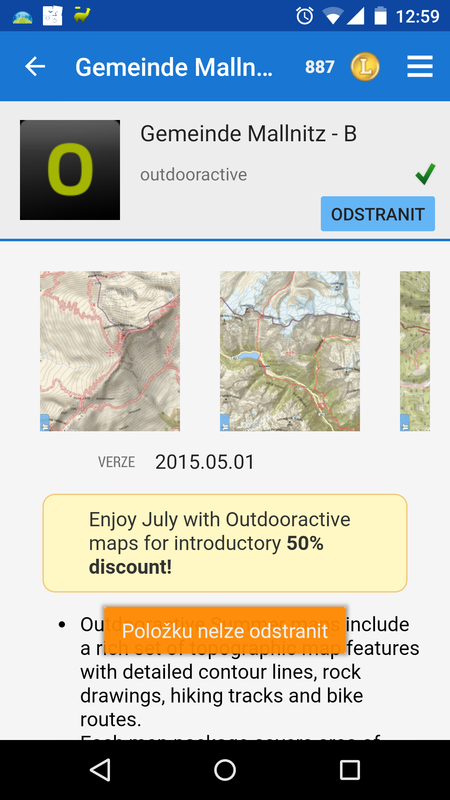 I have problem with offline Outdooractive maps. I purchased one region, it was downloaded ok. Then I found, that I need two more. So I purchased one of these, started download and tried to I purchase second one. When I click download, Locus told me, that I have already one download active and download was not added. I see that map is purchased, there is green tick in description of this map. Map is not downloaded in folder on device. But I'm not able to do anything - even "Remove" ("Odstranit" in czech), it tells me, that It is not possible to remove item. Ah very nice observation. Because downloading of OutdoorActive maps is based on exactly same system as common downloading of online maps in Locus, it really cannot handle two maps at once. Anyway problem is of course incorrect button for download, that display state like you already have map downloaded. Issue found and fixed. Will work as expected in next version (on 99% during today). Sorry for a troubles and thank you for a precise report! I think that downloading of these maps should work in queue. You can click on download on more maps, these will be queued in Download manager and will be downloaded automatically each after each. "I think that downloading of these maps should work in queue"
Absolutely agree!! It is anyway more complex then system that already works for example for vector maps, so I'll definitely try to do something with it in near future.